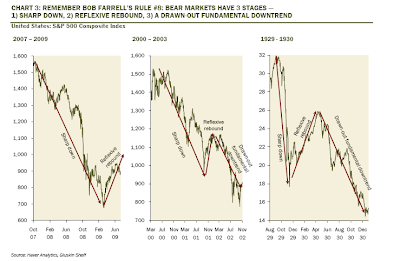 Mish's Global Economic Trend Analysis: What Growth is the S&P 500 Pricing In? What Growth is the S&P 500 Pricing In? Dave Rosenberg is asking the important question What Growth is the S&P 500 Pricing In? Based on past linkages between earnings trends and the pace of economic activity, believe it or not, the S&P 500 is now de facto discounting a 4¼% real GDP growth rate for the coming year. That is what we would call a V-shaped recovery. While it is possible, though in our opinion a low-odds event, it is doubtful that the economy is going to be better than that. So we have a market that is more than fully priced for a post-recession world — any further gains would suggest that we are moving further into the “greed” trade. We realize that the market has to climb a wall of worry and that it will often price in a lot of bad news, but for the first time ever, it has rallied nearly 50% amidst a two-million job slide since March. That is either whistling past the graveyard or at the lows the market was indeed pricing in a full-fledged depression. Think about that last comment. Whatever the market was pricing in at the March lows was obviously a pretty bad outcome, but isn’t that what we saw in the end? To be sure, the government established a floor under the financials, but when you go back and think about the fresh lows posted in late 2002, it was about earnings and the economy, not about financials. Usually, government plays a small role, but this time around, it may be the only actor in the play, and what multiple does that deserve is a very good question, especially now that Uncle Sam’s generosity is supporting a record of nearly 20% of personal income. The fact that we have now resorted to ‘Cash for Clunkers’ to support consumption is a very sorry state of affairs. While the hosts on the CNBC show we were on yesterday afternoon claimed that the bounce in July auto sales was evidence of pent-up demand, we would simply have to disagree. If there was pent-up demand we wouldn’t need the subsidy to begin with — it just goes to show that there will always be people who will be willing to accept free money. What we think is important is how low the level of auto sales were in July, at barely more than 11 million units at an annual rate. It was only nine-years ago that auto-related stimulus (“0% financing”) brought us 21 million units; and just four-years ago another gimmick (“Employee discount for everyone”) brought us 20 million units. The ‘new normal’, we would have to assume after the response to ‘Cash for Clunkers’, is 11 million units. That’s supposed to get us excited over the consumer spending outlook? Keep in mind that we never saw 21 or 20 million units again after those prior programs were unveiled — could it be that we just saw 11 million for the last time too? Reuters did some nifty work and showed that in this last leg of the rally, which started on July 10th, CCC-rated stocks have surged 26.4%, BB-rated stocks are up 19.3%, while AAA-rated stocks have risen 9.5%. Look — when China is up 80% year-to-date, India 60%, and both the Kospi and Hang Seng up 40% — and dare we say, the SOX index up 60% in less than six months — it’s probably safe to assume that we have a huge speculative junky market on our hands. And, we know from the 2000-2001 and 2007-2008 experiences, they don’t tend to end well. The bull/bear spread widened by over 10 percentage points this week; a nightmare for the technical analyst (from a contrary perspective). Rosenberg suggests there will be no recovery without the consumer. I suggest there will be no recovery in consumer spending, discounting of course "free money" programs like "cash for clunkers". Of course this all depends on the definition of "recovery". 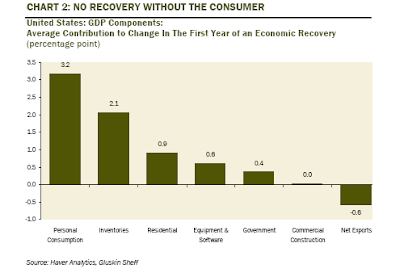 At best, I think we have a "Recoveryless Recovery" before the economy slips back into a double or triple dip recession. Regardless, the stock market is priced for perfection while the odds of perfection are close to zero.